In response to our Sister City Campaign/petition, and the many e-mails received from concerned individuals, Mayor Christine Marick’s office made contact with their counterparts in Anseong. Click HERE for the Sister City Campaign! “The City of Brea recently received numerous e-mails from concerned individuals regarding Anseong, Korea – Brea’s Sister City. The e-mails made upsetting accusations regarding alleged abuse of dogs in Anseong, Korea. City of Brea staff immediately reached out to representatives of the Brea Korean Sister City Association (BKSCA) to help ascertain the validity of these comments. 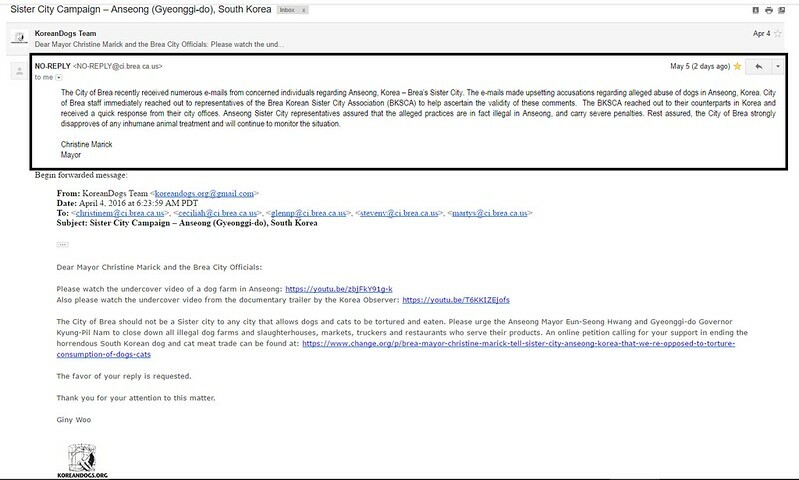 The BKSCA reached out to their counterparts in Korea and received a quick response from their city offices. Anseong Sister City representatives assured that the alleged practices are in fact illegal in Anseong, and carry severe penalties. Rest assured, the City of Brea strongly disapproves of any inhumane animal treatment and will continue to monitor the situation. We are very grateful to Mayor Marick and her colleagues for taking swift action; however, we are disappointed that the City of Brea has been ‘brushed off’ with the disingenuous reply from the city offices in Anseong, who were quick to respond but simply stated that “the alleged practices are in fact illegal in Anseong, and carry severe penalties”. We are again contacting Mayor Marick, to thank her for responding to our concerns but to point out that, although the Anseong statement is true, it is whitewashing the fact that these laws are neither policed nor enforced; and merely put in place “to shun criticism from foreign countries.” (as quoted by Dr Dog: Ann Yong-Geun, August 2011). Click HERE for Mayor Marick’s email addresses and contact info! Dog and Cat Cruelty and Abuse in Anseong, South Korea, for the meat trade. We would like to thank you very much for responding to our petition asking for you to make contact with Mayor Eun-Seong Hwang of Anseong, to urge him to put an end to this trade and thereby the cruelty it embodies. We note, with sadness, however, that the response you received from their city offices is completely disingenuous in that they are simply confirming that these laws are in place in their country. What they appear to have failed to deny is that these laws are being transgressed throughout South Korea on a daily basis: the collected evidence speaks for itself, for example the filming by the Korea Observer, published on Youtube, the clip of which was referenced in our petition. This video, confirming such transgression, is not an isolated example: many pictures, videos, and witness testimonies from caring South Korean Citizens, are available for public viewing on many forms of social media. In addition, Yong-Geun Ann(professor at the Department of Food and Nutrition at Chung Cheong College, and president of The Korean Society of Food and Nutrition – and self-named ‘Dr Dog’), contrary to recognized medical evidence, actively promotes dog eating (“The World Health Organization has warned that eating dog meat increases the risk of contracting cholera 20-fold”). 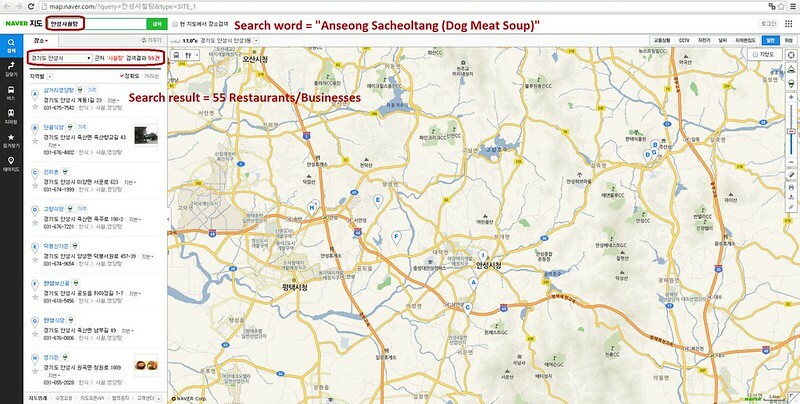 To illustrate the scale of the dog meat business in Anseong, a simple search for “Anseong Dog Meat Restaurant” on a popular search engine in South Korea (called Naver business directory search) produced a list of 71 search results. This proves just how many dog farms and slaughterhouses there must be in, or in close proximity to that city, to be able to supply meat to all of these restaurants (and how many others?). Mayor Marick, we, therefore, urge you to once again review the evidence, and to do everything in your power to help bring an end to the dog meat trade in your Sister City, Anseong. Below are 3 search results on Naver (the most popular search engine in Korea) for dog meat restaurant using three different names used for dog meat soup: Boshintang, Sacheoltang and Youngyangtang. 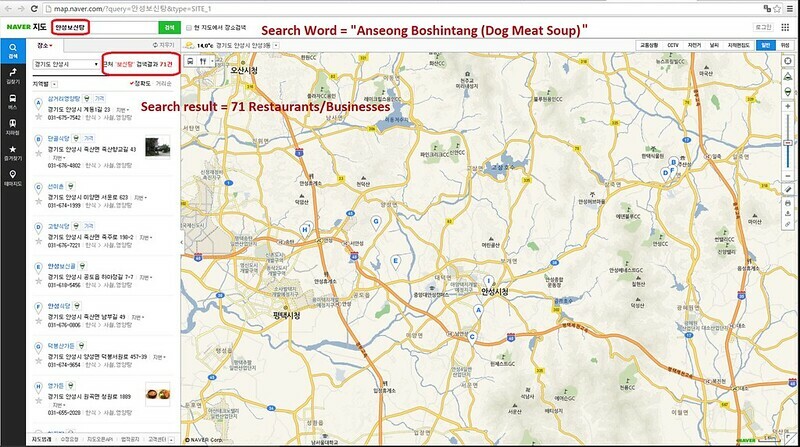 This search resulted in 71 restaurants and businesses in and around the city of Anseong alone. If there are this many restaurants that just serve dog meat soup, imagine how many more dog farms and slaughterhouses would be present in and around Anseong to supply the wider dog-meat demand. It’s too scary to think about it. This heartless,sickening,evil acts on these beautiful dogs & cats has to STOP!!!!! Yes there are laws that are to STOP this horrific acts of cruelty & torture BUT these laws are not being followed nor inforced by people with authority !!!! They must start doing their jobs & make sure these so called human beings are following the laws that are in place.We are NOT going away,with social media you can NO longer hide the evil,heartless,sickening,barbaric acts of pain & torture on these beautiful & smart dogs & cats !!!!!!!!!!!!!!!!!! We all frown down on such countries as yours & will NEVER support such barbaric countries!!!!!!!!!!!!!!!!! All beings created by God deserve respect & dignity.God did NOT create cruelty……. MANKIND did !!!!!!!!!!!!!!!!!!!!!!!!!!! SHAME on all of you !!!!!!!!!!!!!!!!!!!!!!!!!!! Tuer des êtres vivants pour les manger est une abomination. Les animaux et en particulier les chiens et les chats qui vivent chez nous, parmi nous et font partie de notre famille ne sont pas de la nourriture. Une telle cruauté est inacceptable. Il faut que ce massacre s’arrête. Il y a suffisamment d’autres nourritures pour ne pas torturer, blesser, tuer de pauvres animaux, comme les chiens et chats innocents. Agir ainsi est une véritable honte pour tout le pays. There is such vast cruelty within the dog and cat meat trade one cannot even begin to understand the reality of suffering these poor animals endure in the hands of a species for whom they call themselves human beings. NO human being should ever inflict such barbarism towards another living species with only a different appearance than themself. We are most disappointed with the result of or campaign which proves a true reflection on S.Korea as being the monsters they truly are. We will NEVER support this country or any other country who conduct such evil vile cruelty. S. Korean Goverment must have no intelligence , compassion or respect. If or When this country suffers any natural disater we the humans of the world shall not support in any charity of aid. You are a country of disgrace , you Governent and people show no mercy. You are a race of evil beings and there is NO place in this world for evil. The world disrespects you and your country will in turn financially suffer . What goes around, comes around. In good conscience I will boycott any country involved in such savage behavior. Karma is coming so recognize it. I stand w/you Mary Willer – all concerned animal advocates will boycott ALL countries that indulge in this vile cruelty. desde Argentina estoy luchando para terminar con éste sadismo para alimentarse con perros y gatos! exigimos que se aplique la Ley de protección con TODOS los perros en general y sin distinción ! Y que no haya Festival Boknal en Corea, en el mes de Junio y agosto. Por favor!!!! South Korea it’s a cruel and in humane country by the treatment that it gives to the vulnerable and innocent the animals,especially cats and dogs the way this country torture barbarically this our companions for consumption is just tragic and vile,this country known as South Korea should have a complete ban on cats and dogs since they are so disgusting that they torture the animals in the most crueled way possible,the country itself should have sanctions placed for their in humane cruelty! I can’t watch these videos because they raise my blood pressure to dangerous levels! THIS HORRIFIC TORTURE OF INNOCENT DOMESTICATED ANIMALS MUST BE STOPPED! THE ENTIRE PLANET IS DEGRADED BY THE PEOPLE WHO CARRY OUT THESE TORTURES AND THE ONLY WAY IT CAN HEAL IS IF THESE CRIMINALS ARE IMPRISONED! Hank, I find your statement as lowlife as I do the Evil of these that torture for their own selfishness! God has always been, always will and always sees! People like you make me as sick as the ones who torture his creatures! Stop blaming or denying God for what others do in this world! No one, including God, said life would be easy! How easy it is for ones like you to blame or deny God for the Evil that others do! God has his judgement and we are given strength to fight such inhumanity….except you, who would rather use it as an excuse to deny!!!! Hi Gayle, I think the issue here is really about the torture and unimaginable suffering we humans inflict on defenceless cats and dogs in Korea. I think such a vitriolic attack on Hank was unnecessary, he is clearly on the site because he has probably signed petitions agains this heinous practise just like the rest of us, and therefore he deserves thanks for taking action. We’re all allowed an opinion, and frankly, I agree with him. If there was a God, why would he, if we are all god’s creatures allow such horrific cruelty to be inflicted upon those who have NO defence against the monsters who clearly delight in torturing others. It is said that God does not give any more to deal with than we can handle. Well, these animals can’t handle what is being done to them, and frankly, after YEARS of campaigning against animal abuse from protecting whales and bats, dogs and cats and everything, literally, in between, I find myself suffering from chronic depression and flashbacks from awful videos I’ve endured in my fight to understand why this happens. The animals on this planet suffer a holocaust every second of every day at the hands of humans, so where is God when they need him ? Where is God when I need him? Instead of directing your anger at someone who makes a perfectly valid point, and is entirely entitled to do do, focus your anger on those bastards who really deserve it. Respectfully, Clair. The time you’re wasting arguing about God could be put to better use.. Signing petitions or writing or calling embassies!! Stop that evil act ,stop killing dogs and cats. The people in the united states will be made aware of the fact that your people are torturing innocent helpless animals and killing them. You do not enforce the laws that you have in place to protect the animals so the laws are made useless by you. It is just for pretense and matters not to you because you want to reap the profit from your horrific companion animal meat industry. We have fought and exposed the japanese people for murdering the dolphins and now we need to do the same with your people so all people in the world can be made aware of your cruel nation and your actions. You can no longer hide behind laws you refuse to enforce and continue to profit. Many people in the United States will no longer purchase your products when they learn of your savagery and barbaric actions. Your Hundais and your samsung and your LG and your kias,and all your products will not be purchased anymore and you will lose so much money..and not only that..Hollywood has many actors and actresses who get involved in these types of crimes against animals and can quickly expose your nation as the ruthless people that you are. This is so wrong and you will soon pay for not upholding the laws put in place to protect the animals..when these things allvtake place for you, remember the animal activists in your own country who tried to stop this and have to share the shame of being a citizen of such a cruel and barbaric nation of people..
EXCELLENT- ABSOLUTELY EXCELLENT. This Savagery MUST BE STOPPED. Jayne, don’t know where you are from, but you need to know what you are talking about when you state the people of the United States! Every country has the same issues of inhumanity and needs to be stopped! I know of the companies that profit from cruelty of other living beings and I do not buy their products and boycott their companies! Trying to stop the cruelty towards any living being in ANY country is what animal advocates do! WTH does living in the US have to do with wanting to stop this inhumanity! I fight for animals no matter what country it is! Should someone overlook the suffering and injustice of another country because they live in another! What is your friggin problem….you seem to miss the point of the injustice done to all….everywhere!!!! Laws mean nothing if they aren’t enforced. Please do something to stop these horrific acts of inhumanity and disgrace!!! AND EATING DOGS. Join the civilized world. EXCELLENT QUESTION you raise. I felt compelled to post your question on FB. I hope you don’t mind. Koreans beeing world’s greatest hypocrits, will never have FRIENDS, so can’t understand friendship drom dogs and cats. Dogs and cats are pets not food. A live in Belgium, not in the US, we call your country, the dog savages, the dog eaters, the people with NO HEART, AND THE PEOPLE WHO LOVES THERE MONEY BEFORE THE WELL BEING, OF THESE POOR ANIMALS. You are all murderess. What an absolute disgrace and evil country. This should be stopped immediately. The torture is horrendous to these loving dogs. I am unable to watch the video as it makes me cry. Barbaric race. Evil practice that shows no empathy for the animals and complete disregard for their suffering. I hope that publicity is such that Korean people stop eating dog meat permanently. This is psychopathic at worst and narcissistic at best and all it does is show that you have lost your hearts and souls and are sub-human. Shame on the Korean Government and its leaders for allowing this atrocity! No mercy, compassion, humanity or empathy – despicable vile behaviour in 2016 – you bring shame on the human race ! These animals have the gift of life , givan by God or Nature . They have SOULS , the devils who butcher them have NO SOULS . These ugly actions make this planet a hell . These sweet animals are tortured in a horrible way , these people torture our souls too. Put an end to this!!!! Stop the cruelty and torture. Reinforce your laws and take control of your people that inflict such inhumane treatment to dogs and cats. It sickens me. I cannot even bare to watch this video. I know the end result. Until this insane barbarism is stopped, and the Korean gov’t realizes that the killing of dogs and cats is inhumane — and enforces its laws against such horrible actions — I will NOT SPEND EVEN ONE PENNY on anything imported into America from Korea. I will boycott the Olympics, and I will spread the word to my fellow Americans. This MUST STOP NOW!!!!!!!!! Killing the dogs MUST Stop because dogs are friend of our mankind and there are plenty of meats to be eat rather than meat of our friend. Gayle, fyi I sign every petition against animal cruelty that I come accross.I became a vegetarian years ago because of factory farming and the cruelty against farm animals in the u.s.I make sure I don’t vote for it by giving my money to it and driving the market for it.I lend my voice as often as I can to the voiceless and the helpless. This is one of the worst cases of animal cruelty that I have come accross because of the belief that somehow the meat is better if the animals are tortured and die slowly.This suffering the animals are made to endure(dogs and cats mind you) is beyond comprehension.I’ve missed nothing. I think it is you who needs to get your ego in check. This isn’t a contest, its a forum to try and help save dogs and cats in South Korea.Maybe you need to save the criticism for social media such as Facebook. (no offence. just not the time or place for that) lots all do what we think we can here to help stop this. Gayle, fyi I sign every petition against animal cruelty that I come accross.I became a vegetarian years ago because of factory farming and the cruelty against farm animals in the u.s.I make sure I don’t vote for it by giving my money to it and driving the market for it.I lend my voice as often as I can to the voiceless and the helpless. This is one of the worst cases of animal cruelty that I have come accross because of the belief that somehow the meat is better if the animals are tortured and die slowly.This suffering the animals are made to endure(dogs and cats mind you) is beyond comprehension.I’ve missed nothing. I think it is you who needs to get your ego in check. This isn’t a contest, its a forum to try and help save dogs and cats in South Korea.Maybe you need to save the criticism for social media such as Facebook. (no offence. just not the time or place for that) lets all do what we think we can here to help stop this. The practice of killing cats and dogs in the most cruel and savage way is absolutely disgusting…. PLEASE STOP THIS!!!!!!!!!!!!! Please put an end to this! Animals don’t deserve this pain & suffering to be inflicted upon them! I am absolutely appalled that this is being allowed to continue in todays society. Please stop it ? This so uncivilized. How can one take the life of a loyal dog. They must be heathens. Animals treat others animals better. These people are sub human beings below any animal of character. Just horrific. I would never travel to a country who treat their own animals with such cruelty. All the countries that treat their animals like this should not be traveled to. We should not give them any money that would support these type of subhumans. The horror is not what I would expect any tourist would want to see their hard earn money supporting a cruel country that supports animal torture. What a cruel cruel place. It must be hell. I agree we should stop all money supply to these countries who treat animals in cruel torturous way. These counties do not need any of our help to continue on with their uncivilized manner of treating animals in a wicked manner. Boycott these animal cruelty countries. Don’t give them a dime. Put the olympics elsewhere!!!! Action rather than words may make a difference. The authorities do not punish people for breaking the dog meat law. Disassociation may be called for. Oh how brutal and cruel as it can get, how do you who perform these acts sleep at night with so much blood on your hands?? UGH!! So heartless and lacking feeling for other being’s pain and suffering. So shameful! The greatness of a nation is shown in how it treats its’ animals. This barbaric torture has to end! I, and others, continue to boycott these companies, that refused to reply to us, and to publicise these facts. I presume they will wait until their profits are suitably affected before acting, but we will continue our boycotts for at least twice that term, as a reaction to their mercenary lack of integrity, in the face of this cruelty and criminality. STOP THE KILLING OF THESE WONDERFUL ANIMALS!!! GOD IS WATCHING AND YOU WILL BE JUDGED FOR THE TORTURE, AND ABUSE OF HIS PRECIOUS ANIMALS. I’M SURE HE WILL HAVE A VERY HOT PLACE FOR YOU!!! PLEASE bring attention to the horrors inflicted on hundreds of thousands of dogs AND cats in South Korea on barbaric ‘meat dog’ farms. — WHAT RATIONAL, COMPASSIONATE, MORAL & RESPECTABLE SOCIETY WOULD ALLOW THIS? — Where’s the rationality? — Where’s the compassion? — This is pure insanity and horror beyond the pale — PLEASE, LET’S DO THE RIGHT THING — LET’S ABOLISH THESE DRACONIAN, BRUTAL FARMS — LET’S RESCUE THESE DOGS & CATS.